Digital Sculptural Enlargement is rapidly becoming a popular way to get accurate and detailed enlargements of marquettes. The process employs a combination of 3D laser scanning and CNC milling using 3, 4, or more axis milling machines. 3D scanning creates a digital copy of the object being scanned. This digital copy can then be modified or scaled and used to create tool paths for CNC milling equipment. Sculptor Marianne Caroselli recently required these services. 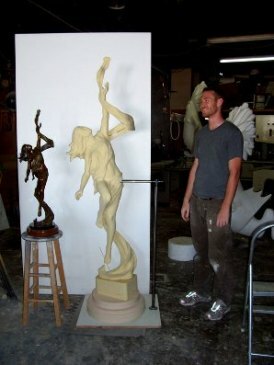 She wanted her "Zenigh" bronze sculpture scaled to twice its current size. The sculpture was sent to Absolute Geometries in Austin, Texas to perform the 3D scanning. The sculpture was scanned with their Faro Laser Scanarm. This scanner takes thousands of 3D measurement points per second to create a point cloud model of the object being scanned. Several dozen separate scans of the sculpture were then aligned and merged using Rapidform XOS software. Rapidform was then used to clean up the scan data and create a watertight mesh file suitable for machining. The resulting file was then scaled up to the required dimensions and sent to Blue Genie Art also located in Austin for the machining. Blue Genie Art specializes in custom artwork for home and business, as well as museums and government. Blue Genie machined the sculpture in 4 pound density foam using their large scale 3 axis CNC mill. A 1/4" tapering CNC bit was used on the mill. Sculptures can be milled in whole or in parts that are then assembled. The foam enlargements can be finished and coated with Polyurea hard-coating, covered in clay and hand worked, or can be sent to a foundry to produce castings. Wood or plastic can also be used in place of foam.